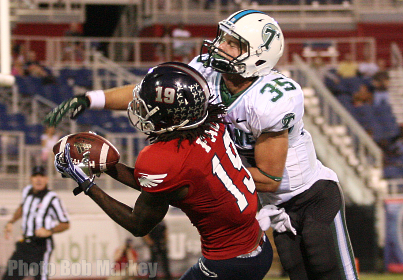 FAU picked up their third win of the season Saturday night, behind a 27-point second and four Tulane turnovers. Interim head coach Brian Wright secured his first career win, while the Owls kept their hopes of a bowl game alive. Defensively FAU held Tulane to just nine first downs and 167 yards of total offense, which stands as the unit’s best outing this season. FAU made a late alteration to their jerseys Saturday. Instead of the players wearing the usual last names across the back of the shoulder pads, they dawned “FAU” as a team. Athletic director Pat Chun explained that the team approached him earlier in the week about making the change, and he approved. Senior captain and center Mustafa Johnson said after the game that cornerback D’Joun Smith was one of the key individuals who endorsed the idea. “I thought it was a great idea, it’s not about the names on the back, it’s about who we play for and the man next to you,” he said. In addition to the new name plates, scout team and walk-on players were on the sidelines for the first time all season wearing white away jerseys. Coach Wright said in his press conference that he was trying to make the entire roster part of the game day experience and wanted to get everyone engaged. Cornerback D’Joun Smith had, what most would call, the game of the year. Smith finished the game with three interceptions tying a school record set by Tavious Polo and Corey Small. The junior finished the game with more interceptions than he did tackles, and after the week the FAU football team has had, the feat seems a little more impressive. Despite the adversity the team faced, most players and personnel stated the attitude of the was not one of pity, but a reason to work that much harder – and work harder is what they did. The defense’s four interceptions came on four consecutive drives, and lead to scoring drives that accounted for 20 of the 27 unanswered points scored by the FAU offense. D’Joun Smith now leads the nation in interceptions with seven this season. - Punter Sean Kelly finally looked like him usual self on Saturday. After battling an ankle injury for a few games, he was stellar against Tulane. Kelly punted six times with an average of 45.2 yards a boot. He had a long of 50 yards and downed two inside the 20-yard line. - William Dukes (pictured) caught three passes for 68 yards and a touchdown. He now has five touchdowns on the year which is one more than he had last season. - Running back Jonathan Wallace left the game in the second quarter with what looked to be like a quad injury. He never returned to the offense and was replaced by Tony Moore and Damian Fortner. Moore saw a majority of the work before Fortner took over and finished with 42-yards and a touchdown. - Jaquez Johnson’s two touchdown runs marked his seventh and eight of the season, which is a school single-season record for a quarterback. Johnson is on pace to challenge the school single-season rushing record of 11 touchdowns set by Alfred Morris in 2009. - Freshman quarterback-turned-defensive back DJ Juste has finally found a role, and that’s on special teams. Midway through the first quarter Juste burst through the line an nearly blocked a Tulane punt. It appears his athletic ability is finally being put to use.